2 bedroom, bathroom, dining room, sitting room, kitchen. Ample parking and private garden. Ten minute drive to historic town of Beauly. Moalnaceap Cottage provides a unique Highland getaway. The cottage comprises of a cosy sitting room with open fire, dining room and suitably equipped kitchen. There are two comfortable bedrooms (twin & double), with ample storage. Other facilities include a BBQ area to the side of the property with garden furniture offering superb views. TV & DvD player Washing machine, parking for two cars and a safely fenced garden for dogs. Moalnaceap Cottage is a lovely peaceful traditional Highland property, 5 miles from the historic town of Beauly, in a beautiful part of Scotland. The cottage boasts a hillside position giving far reaching views down the Glen towards the river and forests, set in a private but open location. It is superbly located for visiting the stunning local glens of Affric and Strathfarrar with convenient access to the East and West coasts including Loch Ness and the Isle of Skye. The local town of Beauly has a selection of unique quality galleries, shops, cafes and public houses, as well as two supermarkets, open until late. Slightly further afield, Inverness also offers a great range of retail shopping, theatre, cinema and venues offering traditional music and restaurants. 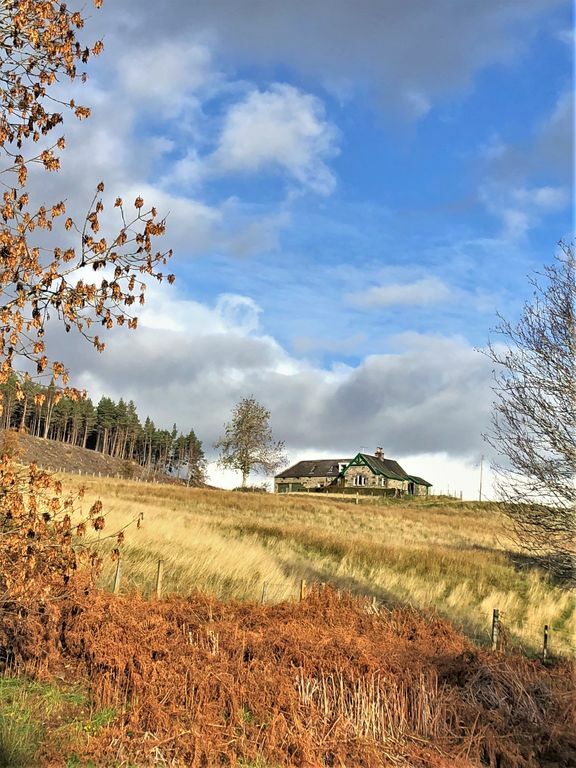 With the cottage being in a commanding position on the fringe of Aigas Forest, it offers a perfect place to enjoy the rich wildlife, such as deer, badger, pine martins, red kites and perhaps you will be lucky enough to see a peregrine or osprey. Keen walkers and outdoor types will be pleased to discover the unlimited local forest and hill walks available in the area and can start from your doorstep. Golfers have the convenience of Aigas Golf course whose Club House is situated no more than 1.5 miles away, where you can enjoy refreshments after a round on their attractive fairways. Moalnaceap Cottage offers a diverse location with guests able to experience activities such as golf, fishing, canoeing or walking, visiting castles, beaches or Scottish distilleries or relax, put your feet up and enjoy its beautiful tranquillity. Moalnaceap is a family owned cottage. It was purchased when my father worked on the nearby Aigas dam as an engineer with the Hydro Electric scheme. It has been part of our family for over 60 years and we ourselves holiday there. I have many happy childhood memories at the cottage. With the cottage being in a commanding position on the fringe of Aigas Forest with no neighbouring properties in view, it offers a perfect place to enjoy the rich wildlife, such as deer, badger, pine martins, red kites and perhaps you will be lucky enough to see a peregrine or osprey. Beauly offers enjoyable local amenities and Inverness is about a 40 minute drive a wayfor a great day out. Keen walkers and outdoor types will be pleased to discover the unlimited local forest and hill walks available in the area and can start from your doorstep. Loch Ness and Uruqhart Castle are about a 40 minute drive away or take a road trip to Eilean Donan Castle Glen Affric is a short drive way, one of the most beautiful glens in Scotland. Golfers have the convenience of Aigas Golf course whose Club House is situated no more than 1.5 miles away, where you can enjoy refreshments after a round on their attractive fairways. New bathroom with shower and W.C.
9 hole course at Aigas and a further 25 courses within a 40 mile radius including the spectacular Castle Stuart Golf Links. What a place to stay! We loved our week in the very cosy cottage. We woke every morning to mist rising over the fields and quite often we were lucky enough to see the deer out of the sitting room window. We spent our week exploring the local area, Glen Affric, Rogie Falls and Plodda Falls were especially beautiful. We also went to Loch Ness, which was only 45 minutes drive away which we thoroughly enjoyed. The highlight of our week was seeing the Northern Lights at the back of the cottage! A sheer delight. Thank you for the Welcome gift on our arrival, a nice surprise. We will definitely be back to this lovely cottage. Thank you for your lovely review of our cottage. I'm so pleased you got to see the Northern lights. The deer love it around the cottage as it is so peaceful. I look forward to you hopefully staying at Moalnaceap again in the future. cottage, from the moment we saw the cottage going up the long windy (and bumpy in places) drive we knew we were going to enjoy a relaxing stay. The welcome basket of tea and a few traditional Scottish treats, shortbread, oatcakes and whiskey liquor was a nice gesture. The radiators were already on making it cosy and the open fire was soon lit to make it even cosier. The views from the large lounge windows are spectacular as they are from the lovely cosy main bedroom. I also really liked the fact all the essentials were there already and so we only needed to buy our own food. We look forward to staying again in the future to enjoy more cosy lazy days just enjoying the views. Thank you very much for your lovely review of Moalnaceap cottage. We're so pleased you enjoyed the cottage and its views and hope you do return at some point. This cottage is a special place, with nothing but the sheep and the birds to disturb the peace. And the complete darkness at night made for some stunning night skies. This place gets under your skin, and soon you feel relaxed. We found peace by the fire. Upon walking back from the forest walks on the doorstep. Equally it was only a 15 min drive to the little village of Beauly with its Co-op, garage and cafes and restaurants. We drove around the stunning Black Isle, watched the dolphins. Caught up with friends, and walked on stunning beaches. All a short drive away. The cottage seems remote, but the nearest house is only a 5 min walk away. Just around the bend out of sight. Of course the price for the location is an off road private lane, which could be difficult and caused a bit of anxiety as my car was brand new! But no prob for most in good weather or any weather with a 4 wheel drive. The cottage itself was homely, cozy, clean and well presented. Enjoy! Thank you so much for your lovely review of our cottage. I am so pleased you had a good time and appreciated its stunning location. If you can overcome the drive up the very rough track you will get some great views from the cottage and enjoy a very peaceful holiday. Thank you very much for your kind comments. The track to the cottage has recently undergone some extra drainage work which will smooth out over time, but is a necessity due to its location. I am so pleased you enjoyed the peace and the magnificent views surrounding the cottage. A place to fall in love with: a charming house in a beautifull setting in nature and surrounded by sheep, a nice open fire place, great walks, very silent and a great hospitality. We hope to return soon! Thank you very much for your delightful comments. We are so pleased you enjoyed your stay. great location, great views and walks. a real gem set in it's own grounds with fantastic views and great walks literally from outside the front door. The cottage is very comfortable and benefits from an open fire. It has comfortable armchairs to relax in the evening and an excellent (new) walk in shower. The views from all windows are great with mountains, woods and deer. The use of a car is essential given Moalnaceap's rural location. Beauly has good range of local shops, (butcher, green grocer, supermarket, coffee and gift shops. Inverness is 15 miles and has theatres, cinema, restaurants as well as city shopping. Please be aware that the road to the cottage is a forestry track that is uneven in places. We advise care be taken, as necessary drainage work has recently been carried out which will take time to settle. Please leave the cottage as you found it ready for the following guests. Many thanks.